Visual Studio Code>Other>Babylon.js file viewerNew to Visual Studio Code? Get it now. This extension adds a preview panel on .babylon file, displaying the file content. 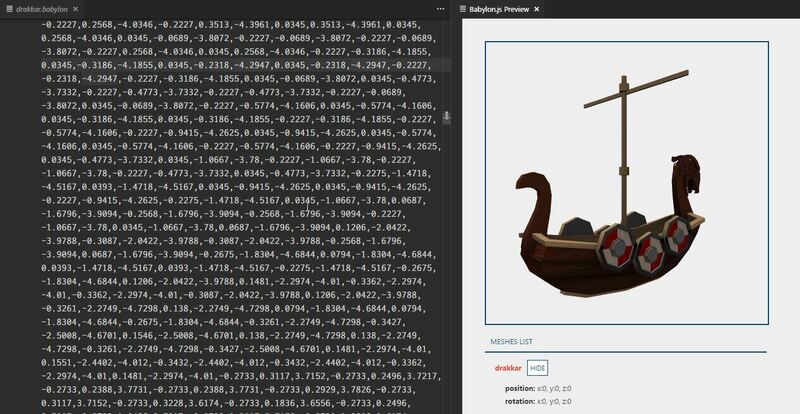 Open a Babylon.js asset file (ends with .babylon). Press CTRL+ALT+O to open the preview panel. Open a Babylon.js asset file (ends with .babylon). Press CTRL+SHIFT+P, and type Babylon. Press Enter. File larger than 5MB cannot be seen by extensions, and thus will not be displayed. Updated for dark themes. Added a button to hide/display a specific mesh Improve support for 2/3 columns. Meshes list added. Replaced black clear color with transparent color. Initial release of this extension.